The 6200B provides accurate phase angle measurements between sinewaves and squarewaves over the frequency range from 10Hz to 1MHz. It also provides a wide input voltage range from 100mVrms to 120Vrms, permitting measurements to be made with greater than 60dB dynamic range between the two input levels. 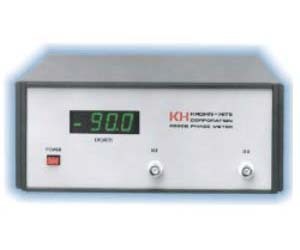 Direct readout of the measured phase angle is provided by a 3 digit LED display, over a continuous range of –180° to +180°. Errors due to input signal noise are minimized. The exceptional stability of the 6200B includes virtually zero drift for short term and better than ±0.2°/30 days, plus a temperature coefficient of better than ±0.03°/°C.